What Structures are Found in Prokaryotic Cells? 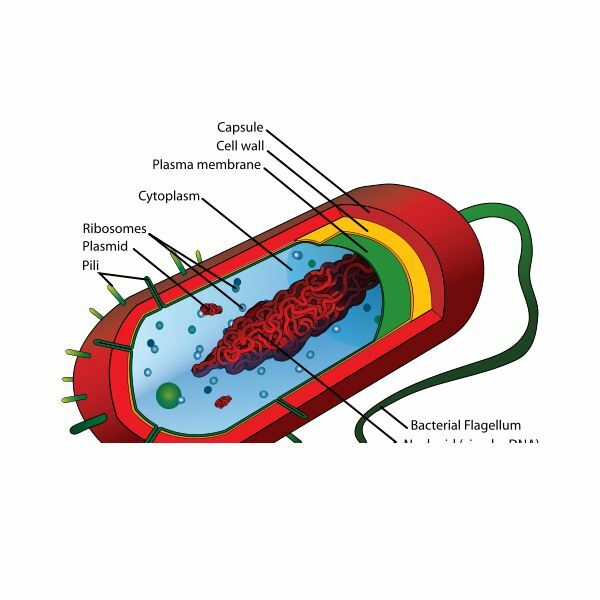 If you were to look inside a prokaryotic cell, one of the first things that would strike you is that there is no nucleus. And it’s not just an ‘intra-cellular brain’ that it lacks. In fact the prokaryotic structure is without any kind of membrane-bound organelle. The genetic material inside prokaryotic cells is contained in a circular loop known as a plasmid. Prokaryotic cells are much smaller and simpler than eukaryotic cells. And whilst their larger cousins make up organisms such as plants, animals, fungi, protozoans and algae, prokaryotic cells can be split into two groups – bacteria and archaea. Plasma membrane – composed of phospholipids and proteins. Semi-permeable and determines what comes in and what goes out of the cell. It is also involved in the replication of DNA. Prokaryotic cells come in a number of different shapes; the main ones are rod-shaped (bacillus), spherical (coccus) and spirillum (spiral). And we have a lot to thank them for. It is a widely held belief that they were the first living organisms and that eukaryotic cells, (which gave rise to much more complex life forms) evolved out of them.